The ring my customer had seen. One of my regular customers recently asked me to quote on a ring she had seen a photo of. She accepted the quote and told me to make it. Rather than take her money I asked her to slow down and look at the piece some more. She later described my request to slow down as "saving her from herself". A salespersons job is to take your money. The job of a jeweller, a person who actually makes jewellery, is to create a piece that is both aesthetically pleasing to you and made well enough to last the test of time. The problem with a photo of a piece of jewellery is it very often gives you no idea of scale. When my customer looked at this photo she naturally imagined it as having been created to the size of the finger she intended to wear it on which may or may not be the case. This ring desciption had some specific details that enabled me to quote. Here is what we knew about the ring in that photo. What we did not know from the photo was the finger size that was shown. It is a very common practise to show diamonds in rings made to very small finger sizes to make the diamonds look bigger in the photos. You can read more about this in this article. She never told me to shut up (I just liked the KFC ad) but she did give me the go ahead to make the ring based solely on the quote and the photo she had seen. She had however not seen the ring scaled to her finger size and I insisted that we look at that before we went any further. My customer had never bothered with an engagement ring. She intended to wear this new ring as a minimalist style engagement ring. The size of her 5mm wide wedding ring was R.33. Here is what this new ring looks like at size R.33 with the same specifications as the one in the photo. She did not like it. The concept was still attractive to my customer but the scale was way off for her finger/hand size. I am going to skip quite a few variations of the design that we looked at and go to the one she approved next. I used actual photos of her hand for this step but have used a digital hand for the purpose of this article. Our diamond is now 2.3 times bigger! Quote again. I have used the word "bigger" here a bit out of context on purpose. The carat size of a diamond is a weight and effects the value and price of a diamond greatly. The diamond weight in the approved design is now 2.3 times that in the original photo. Not only does a larger diamond have more units of value (points, 100 points = 1 carat) that per unit (point) value increases as the weight of the diamond increases. As a basic example, colour and clarity all being equal, the cost of buying 100 x 1 point (.01 carat) diamonds is far less than buying 1 x 100 point (1 carat) diamond. Changing the dimensions of our baguette diamond from 4.5 x 1.5mm to 5.5 x 2.5mm increased that diamond weight from .10 carats to .23 carats. A diamond that size is considerably more valuable than the one in the original photo. I quoted again and it was approved. Yes we are stopping again. We had obtained the finger size from a 5mm wide ring and this ring was narrower at 3.5mm. I informed my customer that it may need to be smaller to feel just right on the same finger and that we would check this with the draft. The draft was created and the ring size she felt fitted best was indeed to her surprise smaller. You can read about how the width of a ring effects the size it needs to be to fit the same finger in this article. In a design like this the weakest part of the metal is the bezel setting holding the diamond. During resizing this area is the most prone to distortion which could damage the very delicate corners of a baguette diamond. It would be preferable to have the ring the correct size prior to setting the diamond into it. You can read more reasons why I prefer not to resize brand new rings here. 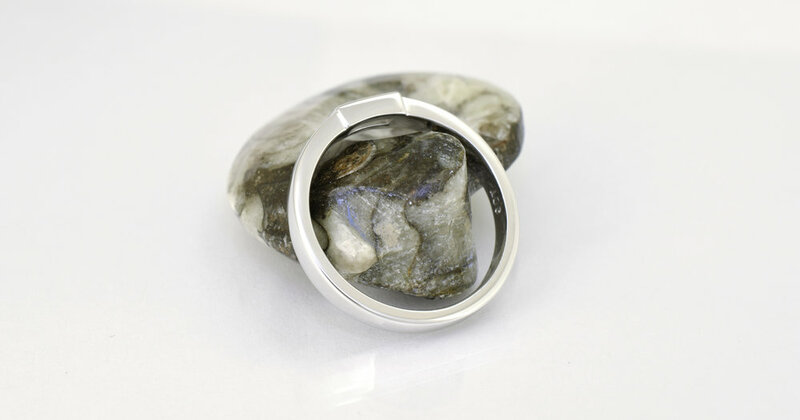 The customer approved the draft and I quickly moved on to making the actual ring which is shown below. If I had just shut up and taken her money she would have been a very disappointed customer instead of the delighted one she is now. I thank her for her patience and repeated support. A trilogy of trilogy rings. A long way from where we started.